Standard players return to play for a chance at the second GP Seattle trophy. THE HASHTAG FOR GRAND PRIX SEATTLE IS #GPSEATTLE. JOIN THE CONVERSATION. 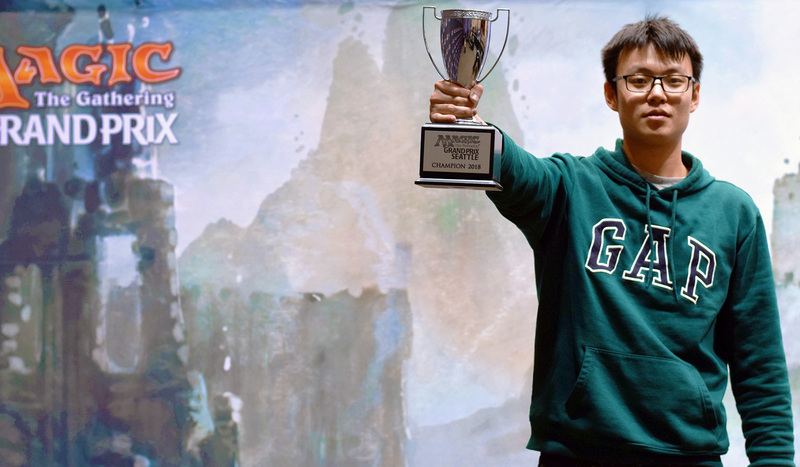 GP Seattle ended in spectacular fashion, with Gan Yan making history as the first player with a perfect Grand Prix record. After going 15-0 in the Swiss, Yan hurtled through the Top 8 with his Mono-Red Aggro deck, defeating fifteen-year-old Grayson Roberts in the finals for a historic finish. Yan was on the streamlined Mono-Red Aggro deck with four copies of Rekindling Phoenix. Roberts played Blue-Red God-Pharaoh’s Gift, the breakout deck of the tournament, with three copies in the Top 8. Roberts was thrilled with his deck choice for the tournament, stating that there were no turn four kills in Standard until this build came along. While Roberts secured a swift win in game one, Yan was able to outmaneuver and disrupt the combo-like blue-red deck in games two and three while dealing enormous chunks of damage with Rekindling Phoenixes and Glorybringers. Congratulations to Gan Yan on his perfect GP and incredible win! This morning, over 1400 players arrived fresh and eager for their first eight rounds of Standard. With established strategies going head-to-head with more recent developments, it was a fierce first day. Be sure to tune in tomorrow for the exciting conclusion of GP Seattle at twitch.tv/magic!